Living Legends helped local groups to develop part of the award-winning Coastal Walkway, a 10km path that forms an expansive sea-edge promenade stretching almost the entire length of New Plymouth, beside the Tasman Sea. The development of the Coastal Walkway has been a spectacular success in attracting both local and visitor communities to use and enjoy the foreshore area. The location is host to the award-winning Te Rewa Rewa bridge which crosses the Waiwhakaiho River and provides access to the Te Rewa Rewa Reserve. This area is administered by the Te Rewa Rewa Management Committee which is a partnership between the Ngati Tawhirikura Hapu of Te Atiawa and the New Plymouth District Council. This joint partnership is an example of kaitiakitanga (guardianship) in a modern day context of which the beneficiaries are the whole community. The extension of the Coastal Walkway just beyond the spectacular Te Rewa Rewa bridge has benefited from Living Legends planting of over 10,000 plants in the area between the walkway and the sea. It is hoped the dense plantings will not only suppress persistent weeds but also help in the stabilisation of the fore-dune. Living Legends will continue to oversee the maintenance of this planting project in conjunction with the Department of Conservation, who will care for it for years to come. 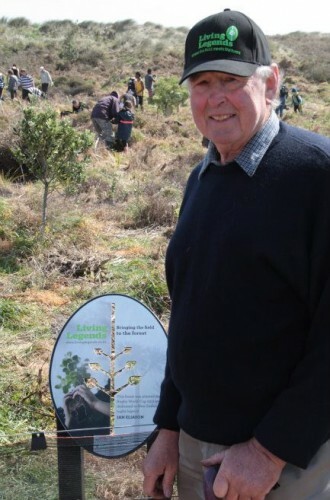 Living Legends would like to thank the Taranaki Tree Trust for their support with this project. Perhaps more than his status as an All Black, Taranaki/Wanganui Rugby Legend Ian Eliason achieved his main rugby recognition for the huge contribution he made to his province. Ian made his debut for Taranaki in 1964 aged only 19 and continued playing for the union until 1981 when he was aged 36. He is thus both one of the youngest and one of the oldest to play for Taranaki. He is still involved with rugby in the province, as President to Taranaki Rugby Union. But it all started as a Taranaki primary school rep from the Kaponga club in rural South Taranaki for Ian Eliason. He went on from there to play for his province and racked up an impressive 222 matches for Taranaki, giving him a share of the record with Canterbury’s Fergie McCormick’s for the most matches for a province. The actual figure is debated however as the Taranaki Rugby Football Union figure includes a non-first class match taking the figure to 223, which would give him the record outright. It is a measure of this achievement that only a handful of others have topped 200 matches for a province. Ian made two All Black tours: the internal tour of 1972 and a few months later the tour to Britain and France of 1972-73. He played 19 games in total for the All Blacks, his greatest achievement in rugby he says. Since hanging up his boots Ian has remained involved in rugby through roles at Taranaki Rugby Football Union, and is kept busy helping his son out on the family farm. When time allows then he fits in games of bowls and loves to travel.